Like all of the “good” firsts in our lives, the anticipation is easily 50 percent or more of the overall experience. 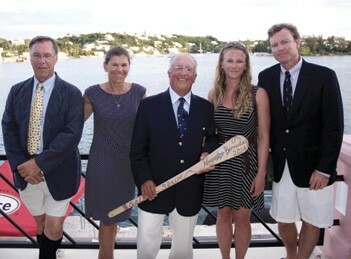 For first-timers Sarah Angell and Sheehan Commette, both dinghy sailors, the anticipation of sailing to Bermuda was the only tenuous aspect of their experiences. How was the actual sailing? Pure enjoyment. “I can’t believe it took me so long to do this,” Angell, a 34-year-old-Rhode Islander, said on Wednesday, fresh from her first shower. “I did some big boat stuff but teams were always looking for experience for long races.” Angell, who sailed aboard the new C&C 41 Jackknife II, saw her opportunity this spring when her company, C&C Yachts (a division of Waterline Systems), was building the new 41 Redline Series. She convinced her boss that it was critical to her marketing strategies to gain intimate knowledge of the new boat and measure the customer experience. He bought it, and Sarah and a co-worker sailed in Jackknife II, skippered by Andrew Hall. “Anxiety” would not be the word Angell and Commette would use to describe their pre-race feelings. Almost the contrary, the two had long been eager to sail offshore but were frustrated with the lack of opportunities. Commette, a 24-year-old from Boulder, CO, arrived Thursday on Juan Corradi’s Concordia yawl Westray, the last-place boat (meaning that she had the longest experience of the two). “I’d been trying to get into offshore sailing,” she said. Then she met a member of Westray’s crew. “We stayed in touch and here I am.” Sheehan’s father is former Olympian and Laser world champion Peter Commette. Freelance journalist Chris Museler lives in Portsmouth, RI. 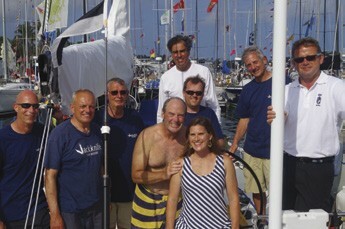 Chris is the Newport Bermuda Race On-board reporter.